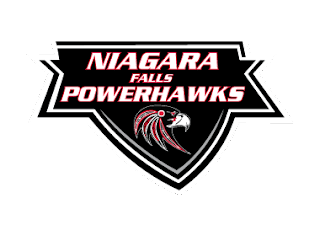 The Niagara Falls PowerHawks are back in action this Saturday and Sunday as they travel to Pittsburgh for some games against the Vengeance. Pittsburgh sits in first place in the East Division by a single point over the Metro Jets. Meanwhile the PowerHawks sit in third place in the Northeast Division, only four points behind Binghamton for second. Saturday’s game is scheduled for 6:30pm. Sunday’s is set to get underway at 11:40am. Pittsburgh is coming off a pair of wins against the Metro Jets, back on November 18th and 19th. They will face off against the Southern Tier Xpress at 8:30pm Friday evening at the Jamestown Savings Bank Arena in Jamestown. The Niagara Falls PowerHawks wrapped up last weekend with a pair of wins against the Oswego Stampede. Earlier this week, Matthew Minichiello and Justin King were called up to the NAHL to play for the Northeast Generals. New goaltender, Josh Mitchell was named Divisional Star of the Week after his play against Oswego. The PowerHawks will be home at the Hyde Park Ice Pavilion on December 9th and 10th as they take on the Jersey Shore Wildcats. Game times are set for 6pm on Saturday and 1pm on Sunday.